Maybe DC dared him? 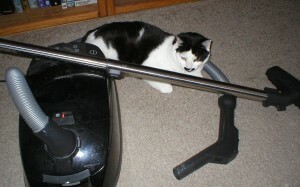 Maybe he was convincing himself that the vacuum cleaner was not a terrible monster? Maybe he was high? Who knows? Ha! I love it! My poor kitty would never do that. She’s terrified of anything that moves or makes a sound! Mine are generally unhappy with the vacuum cleaner, too. This was really surprising.